The scene - The Canadian Consumer Electronics Show (Toronto), entering the Coincident Speaker Technology/Rogue Audio room. The mood - buoyant, but I'll admit to more than a little trepidation over meeting Coincident Speaker Technology principal Israel Blume. As I was just coming off of a mostly positive, yet somewhat critical, review of Coincident's Triumph Signature loudspeaker, I was a little concerned about the greeting I might receive. As the Audiophilia crew entered the room, Mr. Blume immediately asked "Is Jon Gale here?" "Uh Oh", I thought to myself as I switched to full alert, "here we go". To Mr. Blume's credit, while adamantly disagreeing with my assessment of the Triumph Signature's tweeter level, his comments were delivered in nothing less than a gentlemanly and professional manner. I ran my test tones through the new pair of Triumph Signatures immediately upon their arrival. Totally absent from this pair was the rise in the treble heard on the original review sample, save for a very narrow peak around 6 kHz. This peak never intruded on my listening, but did result in a faint highlighting of the upper octaves. Curiously, the shallow trough in the 50-60 Hz region observed on the first pair of Triumph signatures was now absent, the result being a more full-bodied presentation. Intending on playing one track from the newly remastered Dire Straits On Every Street (thank you Canada! ), I ended up playing, and enjoying, the entire disc instead. Based on what I heard from the second review sample, I can confidently recommend the Triumph Signature to potential buyers, particularly when mated with a high-quality subwoofer. I was, however, puzzled by the difference in performance of the two review samples, so I decided to dig a little deeper. 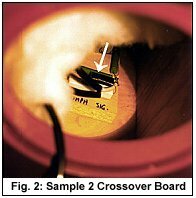 Removing the woofers from each respective sample (which, by the way, are fastened not with wood screws, but socket head cap screws i.e. they screw into a nut or T-nut rather than wood), reveals the crossover components glued to a beefy chunk of MDF, itself firmly glued to the bottom of the cabinet - quite impressive construction for this class of product! 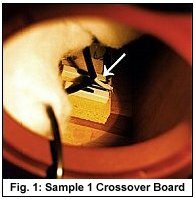 Comparing the crossover board's tweeter legs on the two samples revealed that one of the resistors didn't match (see photos). This was troubling, as I was assured by the manufacturer that both review samples were identical. I also noticed that the first pair had an unmarked crossover board, but the board in the second pair was marked "Triumph Sig." (perhaps the first pair contained the wrong crossover board?) I gather this is where I suggest a manufacturer's comment. Bottom line? While I am somewhat concerned as to the quality control of the Triumph Signatures, I found the second pair to perform superbly, bettering the first pair by a considerable margin. If the second sample is representative of current production, I would have to say that the Coincident Speaker Technology Triumph Signature, coupled with the Vandersteen 2Wq subwoofer, is truly a formidable full-range speaker system, one with the ability to provide great musical pleasure for many years. I would like to thank Audiophilia and particularly Jon Gale for availing himself of the opportunity to do the follow up to his original Triumph Signature review that appeared in the September issue. Jon is to be commended for his open mindedness and his eagerness to resolve this entire issue to everyone's satisfaction. Besides which, he is a hell of a nice guy. Jon's system or room was the culprit. I offered to have Jon take the show pair back with him to evaluate in his reference room and compare them to the original speakers. He did, and his new observations confirm that the Triumph Signatures are break-through speakers at their price that can be highly recommended without reservation. In an attempt to explain the discrepancy in sound between the two samples, Jon observed that the original Triumph Signature used a white color resistor in the tweeter crossover while the second sample had a green one. The green resistor is a very high quality metal oxide unit that was incorporated in all production as of Aug.1, 1998. The first sample actually represented the last units to be shipped with the white resistors. It must be made absolutely clear that no Triumph Signature using the old resistor will suffer from the excessively high tweeter level that characterized the first review sample. The tweeter level is unaffected by the two resistors as they are identical in value. The new metal oxide resistor is, however, more transparent and purer sounding. What actually happened with Jon's first sample is that the resistor failed. This represents a first for any Coincident speaker. In fact, Coincident Speaker Technology has not suffered a single failure in the field on any model. This record of reliability is unparalleled in the industry, and something we at Coincident will never compromise. I guess there must be a first time for everything. The conclusion of this entire affair is that the original Triumph Signature was not operating according to specification due to a faulty resistor. The second sample, and every other Triumph Signature in existence, including those manufactured prior to Aug.1, 1998, will perform as Jon describes in his follow-up. That is a guarantee! We sincerely express our gratitude to Audiophilia and to Jon Gale for their diligence in getting to the bottom of this dilemma and solving it. As Jon noted, the Triumph Signature is constructed to an inordinately high standard, with sonic performance not matched at its very reasonable price point.